Driving through the South of Spain, between Costa de la Luz and the Costa Tropical, you will find yourself within the breathtaking region of Costa Del Sol – which translates to be “Coast of the Sun”. This coast consists of the city of Malaga (the Gateway to Costa Del Sol), Torremolinos, Mijas, Fuengirola, Marbella, and many other small towns along the way. The entire coast deserves exploration and Voyalific wants to help you! We will take you through each town of Costa Del Sol, to show you why each stop along the way is a worthy destination. Let’s begin with the Gateway – Màlaga – Birthplace of Picasso and so much more.. This city was nominated in 2016 to be a candidate for the European Capital of Culture, much due to it’s cultural infrastructure and artistic heritage. Its so-called ‘mile of art’ has been compared to the likes of Madrid, and the fine dining compared to Barcelona. The city’s port had previously been rundown, but since it’s grand rebuilding it has been modernized to capture the essence of Málaga’s culture and heritage. The port now welcomes droves of cruise-line passengers, strongly contributing to the city’s increase in tourism. In this little park within the suburbs, you can find dog walkers, people drinking wine, trees, a small playground, and a lake. It is best known for it’s replica lighthouse in the parks centre, and the colourful display of umbrellas hanging above. If you are a Picasso fan, this museum is a must. You’ll be able to see drawings, paintings, and a few sculptures. The museum provides audio guides in most languages, providing insight on the history of Picasso and his pieces. In the basement underneath the museum, there is an old Roman Ruin which is free to visit. Ps. You are not allowed to take any pictures inside. When craving churros – this is the place. They are light and served hot with a side of dark chocolate or thick hot chocolate for dipping. At 50 cents a piece, you can order a whole plate worth to get you filled up for the day. Guests also recommend the sandwiches and coffee available. This restaurant is a combination of Mediterranean themed cuisine and sushi. With Màlaga being oceanside, it’s hard to beat the seafood. The presentation of the food is immaculate, drinks are reasonably priced, and the atmosphere provides an upmarket feel. Guests have recommended the goat spring roll and the Spanish red wine, Milu. This modern city is part of the reason Costa del Sol has it’s name – enjoying more than 300 sunny days every year, a comfortable average temperature of 19ºC, and 7km of beaches. It preserves the charm of Andalusion traditions, while offering hundreds of restaurants and bars. Who knows why there are so many colourful umbrellas above the streets of Torremolinos and Màlaga, but I do know that it makes for some beautiful photo ops. This square features shops, bars, and restaurants, with shows and concerts in the evenings of August. This area is very gay friendly, trendy, and recognized to be the beating heart of Torremolinos. This is a street lined with endless bars, cafés, restaurants, bakeries, and shops. It makes for a lovely stroll between the city centre and the beach. Bars and shops are open late to grab a quick bite to eat or to have another round of drinks to fuel your walk home. It is quite touristy, but you’d be able to find some local gems within. This path is made for sunset walks on the beach. It features numerous bars, restaurants and shops to eat in, take out, or have delivered to you while on the beach. Pick up some sea shells and lounge on the sun beds sprinkled along the way – making it a perfect way to end your day. 🎼 "Sunshine on my shoulders makes me happy; Sunshine in my eyes can make me cry; Sunshine on the water looks so lovely; Sunshine almost always makes me high! 🎼 John Denver. Happy Friday! This town also sports much of the Mediterranean sunshine, with beautiful beaches on it’s 12 km coastline. 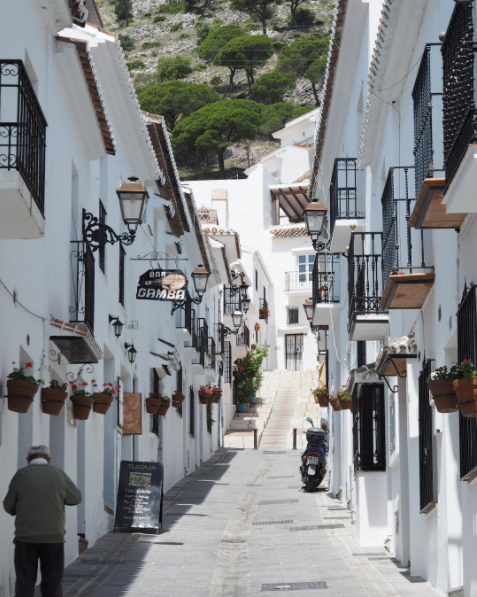 When you’re not seaside, you can venture into the white-washed village of Mijas Pueblo located mountainside. From the top, you can catch a glimpse of Gibraltar, the Atlas Mountains over the African coastline, across from Costa del Sol. Mijas offers the best of beaches, mountains, and scenic city strolls. In the historic centre of Mijas, you can wander the streets, shops, churches, restaurants, and the stunning views it has to offer. Some visitors have seen the city from a horse carriage or the back of a donkey – however you get around, there are gems to be found. This museum offers exemplary food at good value – paired with wine, of course. It is situated amongst beautiful florals and offers a pop of colour in the white town. The city offers stunning views from just about every balcony or rooftop. Look over the hills in the distance, glance to the Mediterranean beside you, and gawk at the city underneath you. This city offers the best of water sports, golf courses, and resort life. If culture is what you’re looking for, visit the History museum to learn about the Cathaginians, Moors, and Visigoths. With a resort styled city like this, you can expect to see a buzzing nightlife worth staying out for. This castle on a hill overlooks the sea, hosting concerts and music festivals in the summer months. It recently featured The Beach Boys, a Blues Festivals, and Sting. It was restored in 1989, and visitors are allowed within the castle walls to provide a fantastic view of the Sun Coast. If you need a break from seafood, or your kids want to see something a bit more familiar on their plate, or you are finishing up a night on the town – Munchies is the place. This menu full of comfort foods is tasty, classic and reasonably prices. Just walk along the coastal strip to find this place, pull up a bar stool, grab a drink, and enjoy a burger while you take in the ocean view. This Smokehouse and Bar is also vegan/vegetarian friendly with a veggie burger and all the sweet potato fries you could hope for. Visitors also rave about the sides — specifically the Frizzy Onions. This is a very large market – walk all the way through and haggle as you go to get the best deal. The market offers hand bags, shoes, clothes, vintage goods, jewelry, and fresh local produce. It is one of the biggest markets in the Costa Del Sol region; worth the visit to buy a quick lunch or try your luck antiquing. This city is recognized to be chic and sun-drenched. It is trendy with it’s modern resort amenities and white washed buildings, while also preserving the Andalusian history. When visiting, one could spend endless days on La Fontanilla Beach; but with the area’s family oriented activity parks, it provides a fun alternative to frying in the sun. Finish off your days amongst the fragrant orange trees and enjoy some of the regions famous dessert wine. This green space faces the harbour, allowing one to watch the big ships pass through, and stretch the eyes a bit further to see the Atlas mountain range in Morocco. The stunning sunsets cast a pink shade on the distant mountains, just at the horizon of the sea. It is a relaxing and tranquil atmosphere to sip on wine and soak in the surroundings. This one is for the outdoor adventure enthusiasts looking to get a step above the crowd. This hike is about 7.5km with a view of the southern coast – ranging from Fuengirola, Eliviria, Marbella, Porto Banus, to Estopona. It is ranked as a moderate to difficult hike, with approximately 2 1/2 hour ascent and about 3-4 hours for descent (which is said to be more challenging with sheer drops and loose rocks). Wear good shoes, bring plenty of water, pick up a hiking stick, have food and first aid on hand. If you aren’t quite at this fitness level, there are many flatter walks within the National Park. The view will be your reward. … Grab your glass of dessert wine, work your toes into the sand, listen to the sound of the waves and let the memories made in Spain wash over you. The sun has to set, even in Costa del Sol. Tell us your favourite stop along the way! We welcome recommendations, tips, and photos from your travels.